Rachel Eugenia (Jean) Harrell, 82 of Darnestown, Maryland went to be with our Lord on March 25, 2019. She was born on October 9, 1936 in Washington DC to Rachel (Mee Mee) Ferguson and William C. Ferguson Sr.. She is now united with her soul mate, loving husband of 51 years, Ivon K. Harrell, in Heaven, who predeceased her. Her five daughters survive her, Barbara Plumley (Jim) of Georgia, Kimberly Helmick (Ted) of Frederick, Wendy Amoriell (Mike) of Ijamsville, Judy Harrell of Florida, Bonnie Ridgley of Germantown, and son-in-law Thomas Nicewarner of Monrovia. She is also survived by 14 grandchildren and 13 great grandchildren. 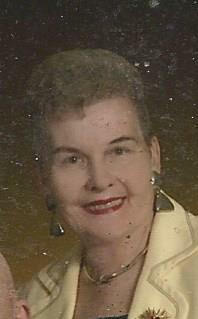 Her brother Jack Ferguson (Aileen) of Boyds, sister-in-law Sarah Ferguson of Rockville. She is predeceased in death by her daughter Karen Nicewarner, her grandson Andrew James Tyler and her older brother William (Bill) Ferguson. She was a past member of Jobs Daughter International, Chapter Bethel 32, where she held the title of “the Queen”. Before she retired, she worked at Nedley Jewelers of Rockville, as the Store Manager and sales person. In the 70’s & 80’s, she was a top sales woman with Dutchmaid clothing where she had won many trips to travel all around the world. She was the type of person that could sell you a winter coat in the middle of summer when it was 100 degrees. When she was an active member at Tri-County Baptist Church and Redland Baptist Church, she was a Sunday School Teacher and held many other positions. She was known for her quick wit, her infectious smile, and her kind and compassionate spirit, as she was the most generous lady you could meet. She always held a very big presence when she was around you. She never met a stranger, and her house was open always to anyone. She loved to host any celebration and the more the merrier. She loved her family very deeply & she enjoyed taking trips with them. She was frequent shopper at Kohl’s, as the cashiers knew her well and she would talk to them like she knew them for years. She loved buying gifts for her daughters, grandchildren and great-children. She also was a frequent visitor of IHop as they had her food already ordered even before she sat down. She had a great love for cats, which was evident with her home decore and wardrobe. She had a passion for the Lord and after her mother passed away, she took the opportunity to start passing out the Daily Bread Devotions to our family. She will be deeply missed and we all look forward to seeing her again in Heaven. Relatives and friends may visit on Monday, April 1, 2019 from 5pm to 8pm at the Roy W. Barber Funeral Home, 21525 Laytonsville Rd. Laytonsville MD 20882, where funeral services will be held on Tuesday, April 2, 2019 at 11am. Interment will follow at Upper Seneca Baptist Cemetery, 23401 Davis Mill Road, Germantown, MD. If you wish, plants & flowers are certainly appreciated, although a donation in Rachel’s name to Tri-County Baptist Church, 7821 Damascus Road, Gaithersburg, Md., 20882 would be welcomed.